No matter how dapper you look in your best suit, what use is it if you don’t smell good? Being a man, deodorant is just as important a step of grooming as any other. Since men are more prone to body odor, a strong deodorant with a pleasant scent is generally a must-have. Whether you wish to leave the ladies swooning at the very pleasant scent emanating from you, or just to socialize with friends and colleagues without the embarrassment of having body odor, here are some best smelling deodorants for men that will surely do the trick! If you’ve been in quest of a high-quality men’s deodorant that is effective and smells great too, the Gillette Endurance Cool Wave Clear Gel could be your answer! For day-long protection, apply the gel on your armpits, and let it dry before you wear your shirt. Feel the fresh scent engulf you and the antiperspirant effect protect you from sweating for hours. The Cool Wave Gel is not to be used on broken skin. Consult a doctor before using it if you have kidney disease. Stop using it if you seem to be allergic to its contents – rashes and irritation indicate signs of allergy. One of the best deodorants for men available, the Gillette Cool Wave Clear Gel has had its customers raving about it with outstanding positive feedback. Much recommended for men who love a nice mild scent that is not too overpowering! Another top-rated choice for the best men’s deodorant, this one is from a company that excels in manufacturing effective antiperspirants and scents that are much raved about. Degree’s Everest Antiperspirant and Deodorant Formula Are a must-have from the Degree Men’s Adrenaline Series if you love a masculine scent with elements that make you reminiscent of woody trees and the outdoors. The product is just as effective as it smells great. Having MotionSense Technology that activates the deodorant when you’re on the move, Degree’s Everest has taken the market by storm, thanks to being super effective for lasting protection from odor, up to 48 hours. The MotionSense feature works through the microcapsules full of fragrance present in the deodorant. These are broken down by friction to release their fragrance – simple, yet effective for feeling great throughout the day! Start your day by using this top-rated men’s deodorant to stay confident and energized. The Everest doesn’t let you down, especially when you need it! If you’re crazy about all things organic, this is surely the way to go! Kaiame Natural’s Deodorant combines all the goodness of unadulterated ingredients to provide a sweet-smelling scent that will keep you fresh for hours. The deodorant contains an activated charcoal powder with an ability to absorb sweat up to 1000 times its own weight, and fight odor. Through the detoxifying properties of activated charcoal, you can expect your armpits to stay cleansed and dry as long as the deodorant is in place. Kaiame’s deodorant also consists of coconut oil, colloidal silver, and magnesium oil, that collectively balance pH and have an antibacterial effect on bacteria that cause offensive odors. With a small amount of baking soda added for further odor protection, the deodorant is good enough to use on sensitive skin. The 100% all-natural formula is supposed to take a bit of time to work perfectly for you since it will at first detox your armpits from all the chemicals you have been applying for years. Free from harsh chemicals, alcohol, parabens, GMO, and phthalate, Kaiame’s lavender deodorant will make your body adjust to it slowly and steadily. Just wipe your armpits and keep reapplying the deodorant during the day initially, then watch it work perfectly for you in a week or two! From the popular sports deodorant series by Right Guard comes the Xtreme Defense Fresh Blast designed specifically to keep odor and wetness in check when you’re on the move. The updated 5-in-1 formula has all you can ask from an antiperspirant-deodorant duo. Available as a solid, gel, and aerosol, the Fresh Blast deodorant has a well-deserved name, thanks to its cool, clean and breezy scent. The new and improved formula contains brilliant sweat-blocking features to ensure your comfort and confidence throughout the day. Promising up to 72 hours of odor protection and up to 48-hour protection from wetness, this effective deodorant with its nominal cost is great for everyday use. Although originally meant for men, the deodorant is surprisingly popular with women as well, who love light scents that are not too overpowering. Overall, a must-try if you’re looking for a go-to solution to your sweat and odor problems. For the best-smelling men’s deodorant, Old Spice has something that could be perfect for you. Their Aqua Reef Deodorant from the Red Zone Collection is a customer’s favorite, with a great scent and effectiveness combined. Offering up to 24 hours of protection from body odor, the Aqua Reef has been formulated without aluminum for safe and everyday use. Enjoy the confidence that comes with one of the most top-rated deodorants that will appeal to all. The scent of the Old Spice Aqua Reef deodorant is a mix of lime and cypress that will make you reminiscent of islands and the tropics. With a plethora of pleased customers, this is surely something you would want to try out for yourself. An effective formula with a great smell from a world-renown brand, Dove’s Clean Comfort Deodorant for Men is a great option to consider when you’re on the lookout for one of the best men’s deodorants. Offering up to 48 hours of protection from offensive body odor and wetness, this formula has been proven clinically to be gentle on the skin so that it won’t irritate. Meanwhile, the ¼ moisturizer technology prevents the armpits from getting irritated due to excessively drying out. A soothing and conditioning mix of pleasant smell and effective deodorizing action, Clean Comfort is a popular choice amongst men who love hygienic practices and smelling fresh all day long. Through the subtle, refreshing notes of this masculine fragrance, you can gain the confidence you need to socialize odor-free! Rarely, if ever, will you come across someone who hasn’t heard of AXE, another wildly popular brand for men’s grooming products. The popularity of its products is mostly well-deserved, especially Phoenix, an AXE Antiperspirant/Deodorant duo manufactured especially for men. Phoenix’s classic masculine fresh and fruity fragrance is appealing to the choosiest of deodorant users. Offering odor protection for up to 24 hours, this men’s deodorant/antiperspirant stick will protect you from wetness due to sweating as well. With hints of lavender, geranium, citrus, and coumarone, Phoenix is designed to be just as attractive scent as its name. Phoenix’s evergreen scent is also available in the form of a body spray, shampoo, and shower gel, apart from this deodorant stick formulation. Use these products together for maximal results, and stay fresh all day long. In a world where you can hardly find anything that is pure, all-natural, and free from processing, harmful chemicals, and additives, safer options are rare. However, you’ll be pleased to know that they do exist, here in the form of a high-quality deodorant stick by Super Natural Goods. With each stick being hand-made in the Nashville area by using some of the finest quality ingredients, this organic deodorant stick is cruelty-free and does not contain any toxic chemicals like phthalate or parabens. The safe and effective formulation is also free from aluminum, chlorohydrate, SLS, propylene glycol, triclosan, synthetic fragrances, and zirconium. With a balanced pH that makes it gentle even on sensitive skin, the deodorant stick is made to provide day-long protection without clogging your underarm pores, unlike chemical-loaded deodorants of big brands. Through its smooth and easy way of application, the organic ingredients in this deodorant stick work as a natural detox to cleanse and nourish your skin and reverse the damage caused by chemicals while keeping it free from unpleasant odors. Smell nice all day, thanks to the lavender and eucalyptus essential oils added to the deodorant mix to provide a subtle scent without the use of any synthetic fragrances. This cost-effective all-natural deodorant stick by Super Natural Goods can last up to as many as 3 months, even with daily use. What better way to invest in health and hygiene than buying such a safe product that apparently can cause no harm? Shopping for the Best Men’s Deodorant? Make Sure You Choose the Right One! Body odor is not a small deal. It is an embarrassment, a nuisance, and even a taboo in some settings. Why not steer clear of this unhygienic menace once and for all by investing in a high-quality men’s deodorant to ease you of your worries? Unfortunately, not all deodorants are effective. Although exaggerated features on deodorant packs can surely be tempting, they are often misleading too. Moreover, different people have different products that work for them. The most popular deodorant might not work for someone due to issues like allergy, or maybe personal preference of scent. 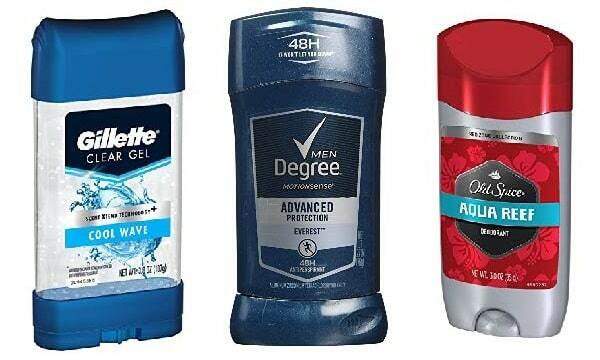 Though in the end, the choice is up to you, we have a few guidelines that can help you make an informed decision on how to buy the best men’s deodorant. Here are a few things you should check before making your purchase. The terms ’antiperspirant’ and ’deodorant’ are often used interchangeably, although they have different meanings. Where deodorants are supposed to keep you smelling nice and fight body odor, antiperspirants work by keeping sweating in check so that odors cannot develop in the first place! If the deodorant you are going for has an antiperspirant feature mentioned as well in the description, consider this an added bonus. When you won’t sweat, there won’t be anything for bacteria to act on to produce body odor! There must be a reason why you’re specifically going for a men’s deodorant, the most obvious one being that you don’t wish to smell feminine. Test the scent of the deodorant you plan on buying to make sure if it appeals to you and is masculine enough, but not too overpowering. Extremely powerful scents can be uncomfortable and a turn-off. Go for lighter, woody scents or cool, breezy ones for the best effect. Watch out for harmful ingredients that could irritate your skin, or be potentially dangerous in the long term. One such common ingredient that is sadly present in many of the best-selling men’s deodorants is Aluminum, with speculations about aerosols containing aluminum being linked to breast cancer. If you ever have a choice between a product that contains aluminum and one that doesn’t, it is recommended that you go for the one that is aluminum-free. Parabens are another ingredient that could be potentially harmful, as could Propylene Glycol, TEA/DEA, Triclosan, and Talc, which is considered as a carcinogen. Since prevention is better than cure, it is better to steer clear of products with such ingredients. Checking out what previous customers have to say about a product can save you money and hassle. Anything that is described in the most appealing of ways is no use when it has a flaw that outweighs its benefits. Be wise, and you will thank yourself for the extra research later! Basic hygiene as well as etiquette requires you to keep clean and smell good – or at least not offensive! Now that you can get the best deodorant for men, you can stay fresh for hours without the discomfort and embarrassment that comes with smelling bad. Choose the one that best suits your skin type and smells good to you. You can now socialize confidently while abandoning any worries of body odor!